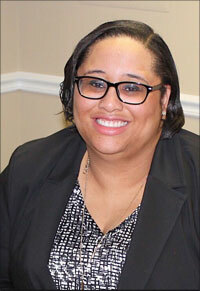 Ashley Bennett, a lifelong Atlantic County resident, was elected District Three Freeholder in 2017. While attending Egg Harbor Township High School, she became an Emergency Medical Technician and discovered her passion to serve others. She holds a B.A. degree from Rutgers University in Psychology, where she also minored in Organizational Leadership and was a Ronal E. McNair Post Baccalaureate Achievement Program Scholar. She went on to earn her masters in Community Counseling at Georgian Court University and a Post Baccalaureate Certificate in Clinical Psychology from Fielding Graduate University, where she worked in The Forensic Neuropsychology Research as a Research Assistant. Ms. Bennett has presented original research at both the Association for Psychological Science and the Association for Behavioral and Cognitive Therapies National Conferences. She has been in the mental health field for a decade and currently works as a psychiatric emergency screener in a local emergency room, where she conducts mental health assessments and links those in crisis with mental health treatment. She is currently completing two additional graduate degrees in Public Health and Business Administration.